Why all the Diet Coke Haters? 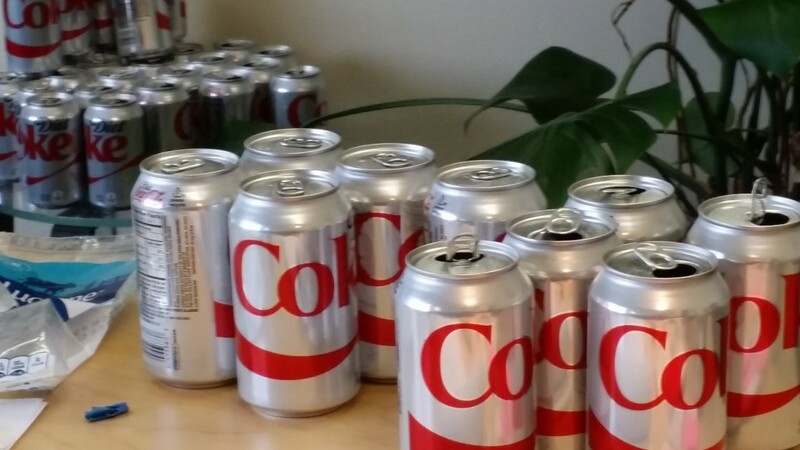 One strange thing I’m noticing, now that I’m about 140 Diet Cokes into this experiment, is that it seems like a lot of people have it out for Diet Cokes. Why the haters? But after two weeks of drinking 10 Diets a day, I have to report that sugared Coke was MUCH worse on my body. But, I’m sensing, from both consumers and researchers, some kind of gut reaction that Diet must be bad. It’s like the opposite of the word “organic.” Organic = Good. Diet Soda = Bad. Many readers this week have sent links to various research studies that claim diet soda still causes weight gain, or insulin resistance, or other disease – but when comparing the results of the studies to the known and quantifiable health dangers of sugared soda, this research on the dangers of Diet is thin, so to speak. The researchers in the studies admit causal difficulties; for example not factoring in caloric consumption in one study, and the fact, in a number of other studies, that people with obesity and related health issues are more likely to choose diet soda in the first place, blurring any increase in health problems in diet soda drinkers. The research about changes in gut bacteria summarizes that the changes appeared individual, occurring in some people and not others. The body’s insulin response to sugar is not individual. Everyone’s insulin rises when they eat sugar, the percent of population that reacts with weight gain and health problems is a monstrous majority. Chemicals. Diet soda is just a mix of chemicals, many people point out. Sure, but they don’t appear related to health problems in the same way as insulin resistance. My favorite complaint about diet soda is that it is used to clean sinks in third world countries. The implication, of course, is that diet soda contains some powerful corrosive poison that is doing the same thing to your body as drain cleaner does to sinks. But it’s just not true. It’s the phosphoric acid and citric acid in the drink that works on some kinds of stains, but it does not damage your body in the same way. You regularly consume citric acid in fruit and phosphoric acid in dairy products, baking powder, and granola bars. It’s like saying that vinegar is bad for you because it can also dissolve the tarnish off an old penny. It’s true: leave a penny resting in a puddle of hot sauce next time you’re at Taco Bell and see it get clean. But that doesn’t mean the hot sauce is bad for you. Hot sauce is good for you; everyone knows that. Take it with a grain of salt, since I’m only two weeks in, but here’s what I’m starting to think: Don’t throw out the baby with the bath water. Don’t let the very insubstantial research about how diet soda may not be as healthy as water stop you from quitting regular soda. The sugar is killing you. Get off it, even by substituting diet soda, and you will be healthier. I’m only two weeks into drinking the diet soda, but I have gained NO weight. The caffeine is having a noticeable effect, but doesn’t seem to be a major issue for my physical stats. And, keep in mind, there are plenty of caffeine-free diet sodas. And phosphoric acid free, if you want. I’m just doing Diet Cokes to get a worst-case scenario. And that scenario, so far, doesn’t appear as bad as the sugared soda scenario. By this point in the regular, sugared, Coke test I had gained almost 15 pounds. How dangerous is that? http://10cokesaday.com/wp-content/uploads/2015/03/2015-03-17-13.12.29.jpg 2322 4128 admin http://10cokesaday.com/wp-content/uploads/2015/06/Ten-Cokes-Logo-300x138.jpg admin2015-03-17 23:17:062015-03-18 18:09:10Why all the Diet Coke Haters? Willians on Another keto tune-up.